Pammy Blogs Beauty: Transform Your Space! CD Shelf Repurposed into a Nail Polish Storage Shelf! Transform Your Space! CD Shelf Repurposed into a Nail Polish Storage Shelf! Don't you just love finding a new use for an old item? My best storage transformation of late? My old CD self, long forgotten an unused in our basement, has a new purpose: Nail Polish Storage!!! My makeup, products, and nail polish storage areas are in desperate need of organizational makeover! As a beauty blogger and product enthusiast, I have more products than I have space. The constant clutter is starting to drive me a bit batty. We live in a relatively small home with limited storage space. So, what is a beauty girl to do? Well, besides sorting though and pairing down my collection, I am in need of better storage solutions! My items always start out organized; but, as my collection grows, I find that I am in need of better solutions. Plus, when one reorganizes into a new system, it does force you to pair-down and get rid of stuff! No, certainly don't "need" this much nail polish (no one person does)! What you see here is a collection that took me years to acquire. Not only do I purchase nail polish myself; but, as a beauty blogger, I get professional samples as well. As these samples come in, I despriately need somewhere organized that I can keep them! Before this new CD shelf Nail Polish storage solution, I had previously been storing my nail polish in snapware containers in the hall closet. See the plastic storage containers at the top of the picture? Those are the containers that my collection was previously housed in. The Snapware was great at first. But, I quickly grew out of it and had polish overflowing into random containers. The worst part was that I couldn't just glance at the collection to "see" the colors that I had and to add new polishes in an organized manner. My dream has always been to organize them by color where I could see everything at a glance. Well, I have finally found a solution that allows for that! Yay!!!! As I was working on basement organization a couple days ago, it hit me: our old CD Shelf would make the perfect nail polish storage shelf! I was literally about to kick this unit to the curb after it didn't sell in a recent yard sale and I am so glad that I didn't! All I did was dust it off and set it in a new space and bam: instant nail polish storage! Actually, it works great for this new purpose! Unlike traditional nail polish racks and shelves that only go one polish deep, this shelf can fit 3-4 bottles deep if needed! 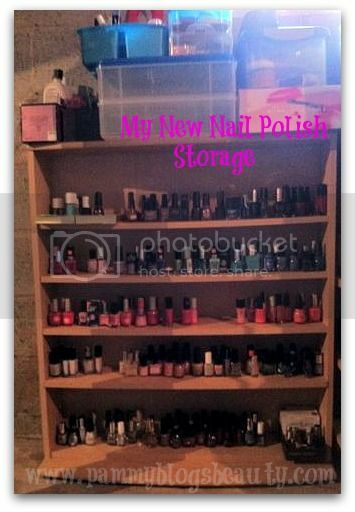 This really allows this storage solution to expand to my needs as my nail polish collection grows. This will work for my nail polish storage for years to come! I am absolutely thrilled!!! Right now, I have the shelf organized generally into color families. On top of the unit, I have my removers, files, nail/manicure essentials, my knockout nails light, and my empty snapware boxes. This area has not really been organized offically just yet as I still figuring that part out. On the upper left shelf, I have a couple trays that contains polishes that I have recently acquired and need to test, review, and photograph. The rest of my top shelf contains Fall/Winter seasonal polishes in dark shades of red, grey, and black. The second shelf houses my purples and blues, the 3rd shelf my pinks, corals, and oranges, the 4th shelf my milky pinks, nudes, taupes, browns, and "uniques" (polishes that really defy categories like duochromes, holograms, heavy metallics, etc), on the bottom shelf I have glitters, crackle/shatter, and some magnetic polishes. Sure, the system still needs some tweaks. While it is still a work in progress, I am thrilled with it so far! This is certainly my best storage area transformation of late! I love being able to see the full range of shades. I think I will have less color duplication with future purchases. Also, I have plenty of room to add polishes as my collection continues to grow over the years. What do you do for nail polish storage? I would love to see or hear about more storage solutions. Have you ever come up with a create or re-purposed nail/makeup storage solution? shelf was purchased by myself years ago. While I was home in May my uncle made me a nail polish rack made of pine. It holds around 100 polishes. I love it. They are no longer stored in a beach bag. I repurposed an Ikea CD cabinet for a makeup storage above my vanity. It's grey with 3 inside glass shelves (adjustable) and a smoked glass door. It was in great condition and we were going to donate it when I looked at it and thought, hmm, that could hold my palettes and a few containers with eye pencils, lip pencils, etc. Up it went and it has been a great space saver! @Inky-Your repurposed IKEA storage sounds just perfect!!! My Uncle knows some carpentry so when he saw my nail polishes in my huge bag he volunteered to make me a shelf with sliding glass. It got different layers so I can arranged my nail polishes according to its color. Now they are all well organized and I can easily pick the color for the week.